The Great NFL Passing Boom Is Over. Hope You Enjoyed It! Backups forced into action, like Jacoby Brissett of the Colts, are one reason offensive numbers are down across the board. In 2011, Drew Brees and the New Orleans Saints spearheaded an aerial assault on the NFL’s record books. Brees not only broke Dan Marino’s single-season passing record by 392 yards, he also led a small army of quarterbacks who either approached (Matthew Stafford, Eli Manning) or also surpassed (Tom Brady) the 27-year-old mark. But that was just the beginning of a six-year offensive explosion that saw repeated leaguewide increases in passes thrown, total yards gained and points scored per game. In 2017, the Saints again boast the league’s most prolific offense1 — but this time, Brees is leading the charge in the other direction. The Saints currently rank 18th in pass attempts — after finishing either first or second in eight of Sean Payton’s 11 full seasons as head coach. Brees is on pace for Saints-career lows in per-game pass attempts and yards — and the rest of the NFL is following suit. In one season, leaguewide passing attempts, passing effectiveness, total yardage and scoring rate stats have all reverted to pre-lockout norms. The revolution appears to be over; the question is why. 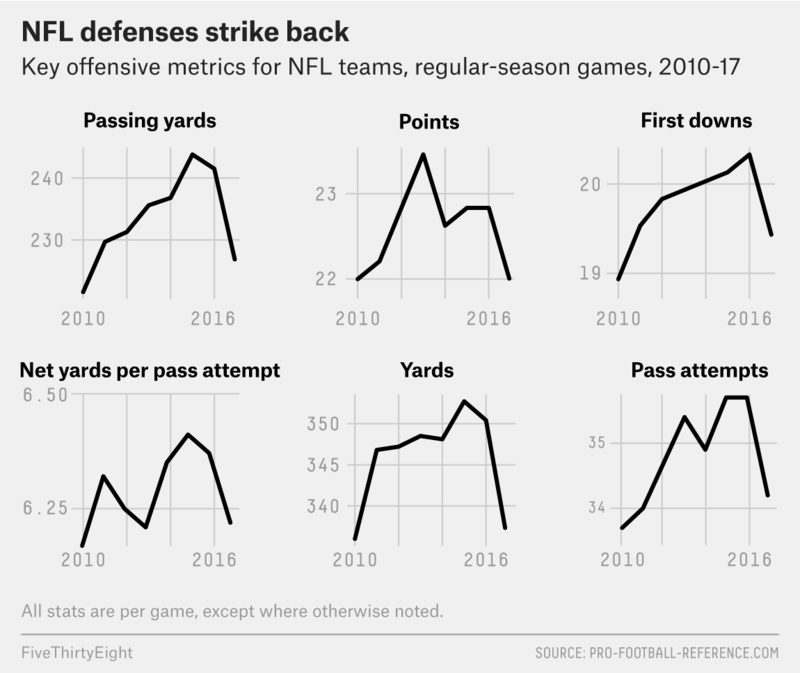 To understand the factors behind the NFL’s offensive implosion, we have to look at what ignited it in the first place. Halfway through the 2011 season, Sports Illustrated’s Peter King had a roundtable of experts advance various theories — from the offseason lockout to the weather. Denver Broncos defensive back Champ Bailey hit on something big: a dramatic increase in the use of shotgun formation. In 1996, three years before Bailey entered the NFL, pro offenses lined up in shotgun formation on just 7 percent of snaps, according to Football Outsiders. By 2011, that figure had increased to 41 percent. In 2016, Chip Kelly’s San Francisco 49ers set a record, using shotgun on 99 percent of their plays. The leaguewide average for last season, 68 percent, matched the league high from just five years earlier. In this decade, teams began throwing more and more. In 2010, the leaguewide per-game pass attempt average was 33.7; last season, it was 35.7. Offenses didn’t have a reason not to throw; it was working. In the 2015 season, NFL teams posted 6.41 net yards per attempt, the highest mark in half a century. Per-game scoring rose from an average of 22.0 points in 2010 to 23.4 points in 2013 — an all-time high — before holding at 22.8 in 2015 and 2016. Total yards per game was already at an all-time high in 2010 (336.0); it rose almost every season afterward until peaking at 352.7 in 2015. The average number of first downs gained per game climbed from 18.9 to a best-ever 20.3 last season. But this year is different. NFL teams have averaged 22.0 points per game, the fewest since 2010. Same goes for per-game yardage (337.1) and first downs gained (19.4). Per-game pass attempts have also dropped, to 34.2, the lowest since 2011. Teams are passing less often, and they’re less effective when they pass. As a result, offensive output is down across the board. As with the explosion, there are plenty of factors that are likely contributing, from the law of diminishing returns to a spate of quarterback injuries. The latter has forced the likes of Jacoby Brissett, Tom Savage and Brett Hundley into headlining roles for their offenses. It also seems that college and pro defensive coaches finally held their own secret meeting; NFL defenses have adjusted how they cover shotgun and spread-style offenses, smothering the short passing game. Defenses are also getting after the passer much better than last year, sacking quarterbacks on 6.5 percent of dropbacks (up from 5.8 percent); that’s the second-highest sack rate since 2006. Payton and the Saints set off the passing explosion, but now they’re on the leading edge of the implosion. The Saints used shotgun less frequently in 2016 than all but seven teams. This season, according to ESPN Stats & Information Group, they’ve run fewer plays in shotgun or pistol than all but four teams. Payton was part of that 2011 roundtable interview, and what he said then still resonates. Teams always pay close attention to how the Super Bowl champions play, Payton said. That year, the champs were the Aaron Rodgers-powered Green Bay Packers, whom Payton said “threw a lot more than they ran it, played good defense and broke the formula of what wins.” That’s “a good starting point in terms of 2011’s passing spike,” he said. The team that everyone’s copying right now didn’t win the Super Bowl, but they came close. The Atlanta Falcons used shotgun less than any other team during their 2016 run to the big game, lining up under center on 60 percent of snaps. The Falcons led the league in scoring, racking up 71 more points than the second-best Saints. They threw the ball just 537 times, seventh-fewest in the NFL, while finishing fifth in rushing yards thanks to a hot tailback tandem of Devonta Freeman and Tevin Coleman. Payton seemed to follow suit. He bolstered his running game, adding tailbacks Adrian Peterson and Alvin Kamara, as well as free-agent guard Larry Warford. Peterson didn’t work out, but Warford and Kamara did — and now Kamara and Mark Ingram are one of the best running-back tandems of all time and the Saints are No. 1 in offensive yardage. It’s difficult to imagine the NFL returning to the shotgun-averse state it was in when Bailey entered the league. Giving quarterbacks more time, a better look at the field and more options just has too many inherent advantages. But teams that can both run and pass the ball well from under center will always be harder to defend, and teams that can’t throw the ball well are no longer putting up big numbers just by throwing it more. In terms of total offensive yards.